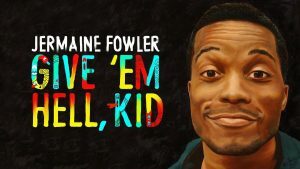 Comedy Dynamics will release Jermaine Fowler’s stand-up comedy special, Give ‘Em Hell Kid on the Comedy Dynamics Network via iTunes, Google Play, Amazon Prime Video, Charter, Dish, Spectrum and more on April 30, 2019. The album will be released May 3, 2019, on iTunes, Google Play, Spotify and more. Comedian Jermaine Fowler performs his first-ever stand-up special, poking fun at his life in hilarious detail. From being raised by his young parents to growing up with a brother his family thought was mentally challenged. Jermaine Fowler is a comedian, writer, and actor best known for his role in the TV series Superior Donuts. He produced and starred in his debut stand up comedy special titled Give ‘Em Hell, Kid which debuted on Showtime. Jermaine has also appeared on Friends of the People, The Eric Andre Show, Lucas Bro. Moving Co., BoJack Horseman, Comedy Underground with Dave Attell, Delores and Jermaine, Robot Chicken, Morris, and the Cow, Family Guy, Crashing, Sorry to Bother You and more. In 2017, Jermaine became the first African American announcer in Primetime Emmys history. Jermaine can be seen in an upcoming feature titled Buffaloed, which will premiere at the 2019 Tribeca Film Festival. “Jermaine is a great, young comedy mind with an immeasurable amount of talent. This special will go a long way in proving that, and more, to the masses,” said Brian Volk-Weiss, CEO of Comedy Dynamics.